It happened on a hot day in rough terrain, and firefighters in western P.E.I. 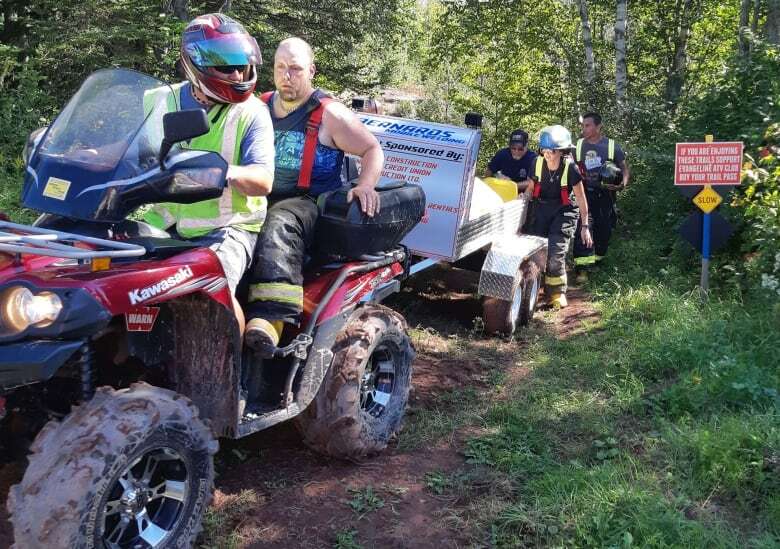 were happy they had motorized help to rescue a Nova Scotia man who rolled his ATV Thursday. Just before 1:30 p.m. the Wellington Fire Department responded to a call of an injured man on the ATV trail system near Richmond. In a news release, department communications officer Desmond Arsenault said the trails in the area include steep embankments. The accident happened about 500 metres from the nearest road. It was exactly the kind of situation the department's ATV rescue trailer, acquired in June, was designed for. ATV trailer extends reach of rescuers in western P.E.I. "Without this trailer it would have been a very gruelling transport for our members in the 24 degree heat and rough terrain," said Arsenault. As it was, the rescue still took two and a half hours. The Evangeline ATV Club helped out as well. This was the first time the trailer was used, and Arsenault said the department is very pleased with how it worked.